Oh Fall! I love everything about this season! The changing colors, the cooler temps, the attitude of gratitude. There’s just something special about this time of year. Another thing I love about this season is all of the Fall products! Today I have a layout to share with you using two cut files, Fall Foliage and Leaf It to Me, from The Cut Shoppe. I started in Cricut Design Space by slicing apart the two cut files. I used the larger leaf with the heart from the Fall Foliage Cut File & one of the intricate leaves from the Leaf It to Me Cut File. I duplicated the leaf with the heart twice so I had 3 of the same leaf on the design screen. I used the contour feature to hide the heart in 2 of the leaves and used the same contour feature to hide the leaf so only the heart remained. I cut all of the leaves on 6×6 Patterned Papers from the Pinkfresh Studio Indigo Hills 2 Collection. I added mixed media to the background using a couple different Shimmerz Paints and a purple watercolor from the Prima Odyssey Watercolor Confections. Before I started adhering anything to the white cardstock, I used 3 different purple embroidery flosses to handstitch the wreath, starting with the darkest color on the outside. I adhered my photo behind the heart and added white stitching around the heart to help the photo stand out from the background. I then started adhering the cut files and die cuts from the Pinkfresh Studio Indigo Hills 2 Collection around the wreath. Then came the epic saga of coming up with a title. I liked the look of the “Love” die cut because it mimicked the white stitching around the photo, but I couldn’t figure out what else to pair with it. I tried a couple different alphas, but ultimately decided on the Gold Puffy Alphas from the same Pinkfresh Studio Indigo Hills 2 Collection. Now you can take a look at my YouTube Process Video that includes a Cricut Design Space tutorial. 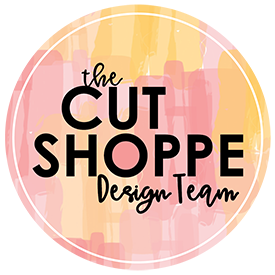 Remember to visit The Cut Shoppe Etsy Store to check out all of the cut files & digital collections! This blog post contains affiliate links. This means I will receive a commission (at no cost to you) from items purchased from these links.